Yes food fans, we saved the worst for last. A lunch and a dinner there over the past several days confirms that nothing has changed about Olives since it first opened its doors ten years ago. Todd English’s food is as overwrought, artless and boring as ever. Which is quite a feat when you think about it. Cooking ingredient-heavy, complicated food that is bland and uninteresting is nothing short of genius, but English and his minions seemingly do the impossible every time we dine here. We stroll in every year or so just to take comfort in the incessant banality of the place. 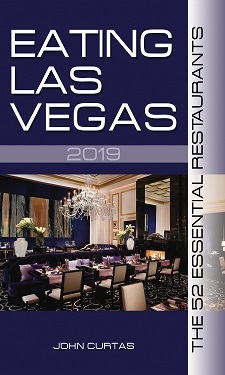 It’s almost heartwarming in fact, to realize that some things remain eternal in the restaurant world: Todd English will be forever famous for forgettable food, and Olives Las Vegas is the poster restaurant for Celebrity Chef Hell. Actually, Hell’s Celebrity Chef Restaurant® serves nothing but Todd English and Emeril Lagasse recipes, whipped up by fat guys in red ponytails and orange clogs…all presented with a booming voice-over commentary by Cat Cora, while Rocco DiSpirito dances in the background. The whole concoction sat atop a stale, brioche bun, and was dabbed with two (count ’em…two!) toppings: the same black olive tapenade that accompanied the bread, and a sweet, red-pepper spread — neither of which brought anything to the party. The menu said it was a sour cherry mascarpone and ricotta cannoli. It tasted of none of those…although the cannoli shell was frozen and rock hard, just like you’d get in a bad Italian bakery…or more likely, some low-end, supermarket “bake shop” trying to imitate a cheap Italian bakery. On the plus side, we got to lunch and visit with uber-SoCal-food-dude Russell Wong:…the fountains were fun: ….and the two little girls at the next table were adorable: …so the meal wasn’t a total loss. Lunch for three, with one person getting the $25 special, and the other eating only soup and salad, and yours truly getting the pasta and crab cakes plus two $18 glasses of wine, came to $186 (including a $30 tip)…all of which left us feeling like this guy. Merry Christmas and all that….. I gotta admit, the Olives piece is funny. Merry Christmas. And if he comes back again, we’re gonna kill him again. Talk about taking one for the team. Thanks John! I walked into Olives to have lunch once. We sat down, glanced over the menu, went into shock over the obscenely overpriced glasses of crap wine, and left. I don’t even think the bread hit the table before we were outta there. That crab cake looks like a big burnt piece of C#*P!! No lump in there? Looks like the “Special” crabmeat. I can’t believe they are OK selling that garbage. Most of those plates you showed look horrid! I hope they were not takin before you started eating! Oh, and you mentioned Rocco Di. That guy doesn’t really RUN any restaurants does he??? I mean, he’s just a face for BravoTV right? I know people always introduce him as a chef but. . .
ELV, thank you for the lunch, where my beet salad (not pictured) was decent, the close-up view of the Fountains of Bellagio was incredible, and the presence of The Food Gal® was … delicious! btw…Our experience at Olives in Aspen sounds very similar! Excited to eat at Olives, once entrees came, excited to leave. $130 worth of disappointment.